There is a bridge stretching over Lake Pontchartrain, a very long bridge, which connects Mandeville to Metairie, Louisiana, just outside of New Orleans. We made our way past the gilded Superdome, onto Poydras to Decatur St. The scent of boiled crawfish, brewed Abita beer and fried beignets pierced the air. There is a tangible excitement in the streets, an energy as the city marches to the beat of its own drum, king cakes baking, jazz pouring out of every nook and cranny, rod iron rails decorated with colorful beads. It’s Carnival Time! The occasion calls for a visit to one of my favorite spots in New Orleans, Café du Monde. The emerald green and white striped awning greeted us, welcoming us to our home away from home with open arms … and café au lait and beignets! We found a spot at one of the speckled, sugar dusted circular tables. Visitors from all over the world came to celebrate the season. Piles of camera bags, men in less than flattering shorts, gluttonous pigeons and hot beignets covered in mounds of powdered sugar filled the open-air café. Immediately, I became captivated by my surroundings and began watching a businessman, most likely a local, talking on his cell phone in the middle of the café.“How in the world is he carrying on a conversation with all of this celebrating going on?” It was in that moment when I heard him say, “Hold on, a pigeon is about to fly on top of this girls head!” Before I could turn around to get my eyes on the ill-fated girl, I felt something brush the top of my head as I bit into my beignet. Exhaling out of pure shock (and unfortunately covering everyone around me in a cloud of powered sugar), the lively café came to a screeching halt as I began waving frantically, attempting to get the pigeon away from me. My effort completely failed as one of its tiny feet got caught in my ponytail. That’s when the real floorshow began. A flurry of feathers, blonde hair, skinny arms and sugar began to brawl right smack dab in the middle of Café du Monde. An uproarious laughter filled the café, the bird finally got its footing and made a quick escape to the rafters. 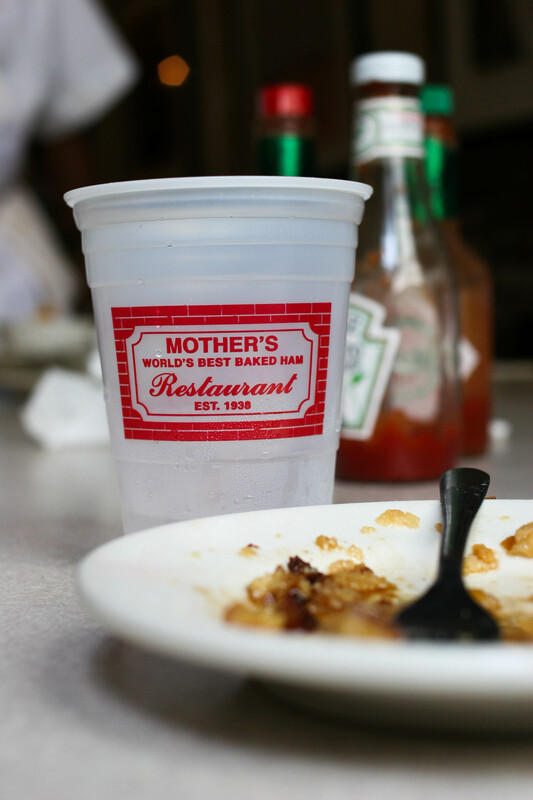 Everyone cheered, plates full of beignets slapped the tables, coffee cups clanked together and everything went back to its harmoniously brassy New Orleans self. Our waitress placed another plate of hot beignets in front of me with a smirk. I knew she had seen the spectacle, and I also noticed she gave us twice as many beignets as we originally ordered. I think she felt bad for me. I didn’t mind. An extra order of hot beignets at Café du Monde was worth the trauma and disheveled hairdo. I cautiously devoured my glorious “pity” beignets as I kept one eye on the hot fried dough and one on the greedy pigeons above me. Across the way in Jackson Square, someone began playing “When the Saints Go Marching In” for the tourists. No matter how many times I hear this song being played on the streets of New Orleans, I’m always surprised how it bewitches me. I’ll always have the spirit of Mardi Gras in my pocket, carrying it with me wherever I go and maybe a beignet or two! Laissez les bon temps roulez! Note: These buttery, sugar-covered beignets, are traditionally eaten on Fat Tuesday, Mardi Gras, during Carnival season right before the season of Lent. But honestly, I love to serve them year round to keep the spirit of Mardi Gras alive! If you don’t have superfine sugar, don’t worry. Just whiz up some granulated sugar in a food processor until superfine! Also, you can also substitute the grapefruit zest for lemon, lime or orange zest. In a small bowl, combine sugar and zest. Rub the zest into the sugar with your fingertips. Set aside. In a stand mixer fitted with a batter attachment, combine flour, salt and baking powder with a fork. Create a well in the center and add the rest of the ingredients, including the zest-infused sugar. Mix until the ingredients are combined and begin to form soft dough. Shape the dough into a ball, cover in plastic wrap and refrigerate for 2 hours. On a generously floured surface, roll the dough out until ¼-inch thick. Cut into 16×2-inch strips. Cut again on a diagonal, creating diamond shaped pieces. The dough is very delicate, so be as gentle as possible! Over medium heat, pour 2-inches of oil in a large cast-iron skillet. Once the oil reaches 325oF, gently place the diamond-shaped pieces of dough into the oil, allowing them to get beautifully golden on both sides. Drain on paper towels or paper bags and toss in superfine sugar. Devour immediately! If by some miracle there are any leftover, just seal them up in a plastic bag, stash them on the counter, et voilà! Breakfast is served! My favorite time to visit New Orleans is during springtime. Azaleas radiate with blushing hues, early blooming magnolias perfume the streets, breezes from the river tousle my golden locks, and the air is softly sweetened with the city’s many treats. I always stand astonished at Aunt Sally’s as pralines the size of moon pies studded with toasted pecans lay in a row, basking in front of an old fan, awaiting their fate to be boxed up and devoured within mere moments. Looming next door at Café Du Monde is a different type of lure, one that was deep fried and laden with powdered sugar, begging to be washed down with a café au lait. New Orleans offers another treat, one that entices and excites as it gleams and glows with its amber flames and saccharine scent. Brennan’s Bananas Foster. There is a tinge of delight that never grows old as this famous dessert is prepared tableside, blazes and all. Even though I sit in pure elegance of the restaurant, the combination of cinnamon, butter and sugar will always remind me of the swamp and the bananas added to the concoction of tiny pirogues bubbling away in the murky darkness. No amount of sophistication will ever make me outgrow my bayou roots. As my imagination twirls, rum is added to the sauté pan and whoosh. The flickering flame engulfs everything in its sight. Surrounding tables applaud at the spectacle while the spark dies down and all that’s left is bourbon-brown bananas scented with spicy cinnamon and sugary rum. Traditionally, this delectable dessert is spooned over ice cream, but I decided to do a spin on this New Orleans classic. 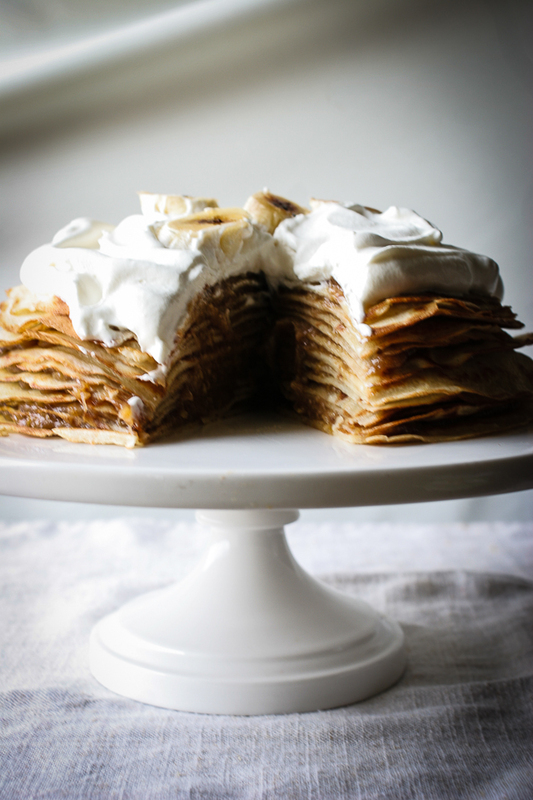 Once the bananas have browned in the sugar and butter, I mash the whole mixture together and use it as a filling for a crêpe cake, delicately adored with whipped cream spiced with rum and caramelized bananas. Springtime couldn’t get any sweeter. In a sauté pan over medium-low heat, melt butter in the pan. Once the butter has melted, add the sugar, cinnamon and vanilla to the pan. Stir until dissolved and add bananas. Whenever the slices begin to brown and soften, carefully add the rum (if using.) Light the pan with a long match or a torch. Allow the flames to subside. Let cool and mash with the back of a fork or a potato masher until thick and almost a puréed consistency. Combine water, milk, eggs, flour, vanilla, sugar and salt in a blender. Blend until all of the ingredients are well incorporated and the mixture is no longer lumpy. Scrape down the sides and blend again. Add the butter to the mixture and blend for just a few more seconds. Let the mixture rest in the fridge for an hour. Place a nonstick skillet on medium to medium-low heat. Brush butter onto the pan. With the batter in one hand and the hot skillet in the other, slowly pour the batter into the pan and twirl the skillet in the other so that there is enough batter to purely coat the bottom of the pan. Let the crêpe cook just until brown at the edges, flip with a spatula and brown on the other side. Flip onto a plate and continue with the remaining batter. Whisk all of the ingredients in a stand mixer until soft peaks form. The whipped cream should be able to hold a peak if inverted. *Note: For the caramelized bananas, sprinkle sugar onto 1” slices of banana. 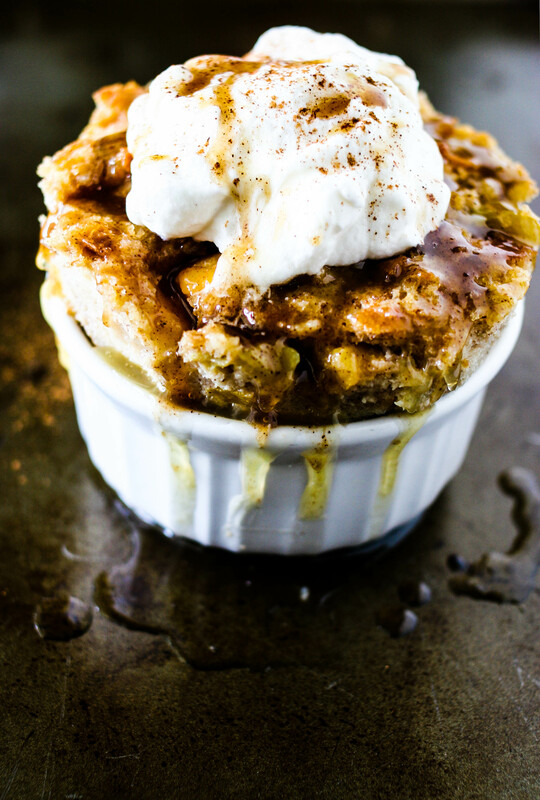 Using a torch, carefully caramelize the top of the banana like you would a crème brûlée. 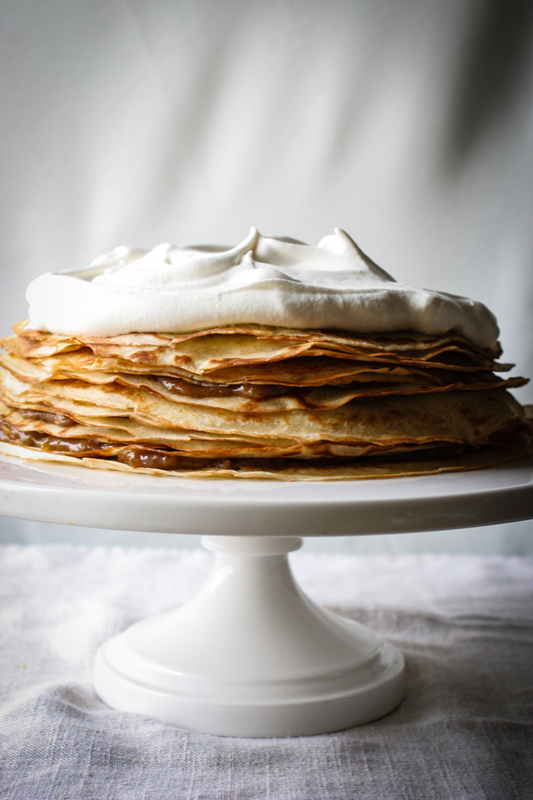 On a cake stand, place one crepe on the bottom of the stand. 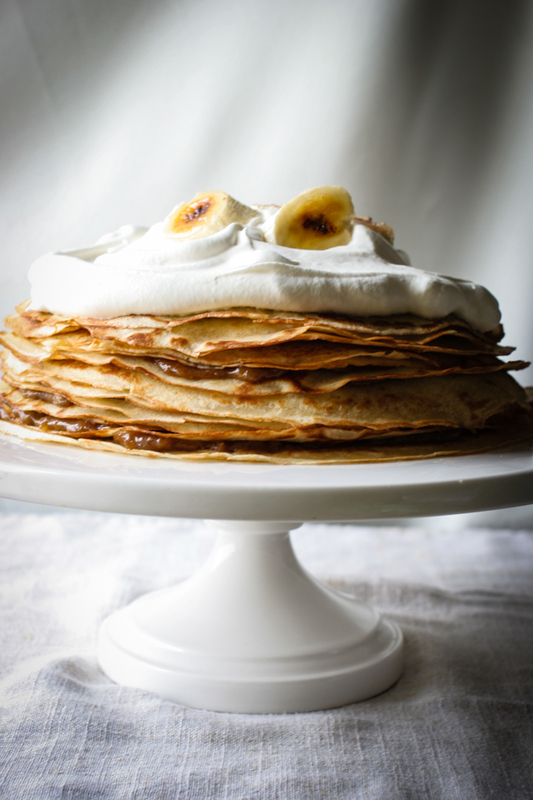 Spread a thin layer of the bananas foster purée onto the crêpe. Repeat with remaining layers until you add the last crêpe (or run out of filling! Whichever comes first.) 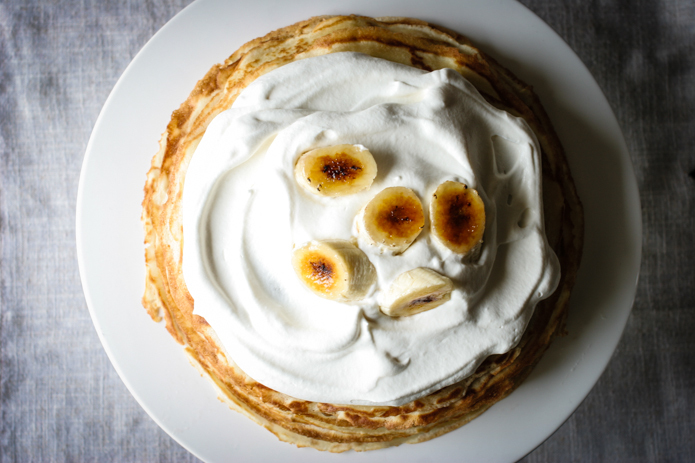 Finish the last crêpe with a topping of the rum whipped cream and adorn with caramelized bananas.